SZA is an American R&B artist that has been on quite the roll over the past year. She’s taken the R&B world by storm, had multiple hits, and was nominated for five Grammy Awards in her first year of eligibility. She was even featured on the outstanding Black Panther album for the film of the same name. The song “Broken Clocks” was released as a promotional single for SZA’s debut album CTRL in June 2017. The song was officially released as the album’s fourth single, and SZA performed the track at the 60th Annual Grammy Awards. The song is a laid back, melodic jam that focuses on SZA’s problem of maintaining both her work and personal lives. The song goes for a real nostalgic feel which pairs well with both the music video and SZA’s raspy vocals. On first listen, the track may sound like an old jam from a bygone era, but you quickly realize that this is something completely new that you’ve never heard before. That’s SZA in a nutshell, offering up new yet familiar sounds on the daily. The music video depicts SZA reliving her childhood with a group of misfits at a summer camp, aptly called Camp CTRL. 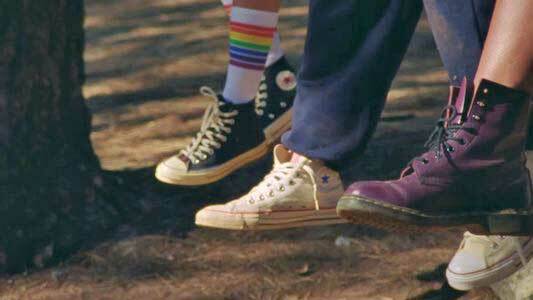 The setting offers up plenty of people in chucks, as they are the perfect shoe for summer camp hijinks and the campers make use of them throughout the video. The gang spend the video running through the woods, competing in challenges, having food fights, and telling stories around a campfire. The video may seem to not really work well with the songs lyrics at first, but it actually is a clever way to show SZA’s issues. By focusing on a carefree and fun filled childhood, the video helps highlight the issue of balance between work and personal life that SZA is talking about. Childhood was simpler time where you focused on enjoying yourself, and SZA is attempting to get back to that mindset in this song. In a roundabout way, this really is the perfect video for this song. Many of the campers and workers wear chucks in this video. Use the links below to get yourself a new pair of chucks to wear at summer camp.